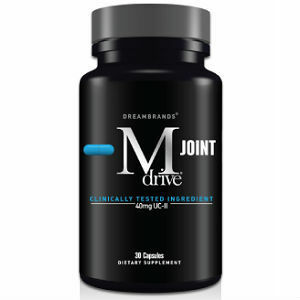 MDrive has developed and launched Mdrive – Joint, a product to support joint health. C-II, the main ingredient in Mdrive Joint, is a standardized source of undenatured type II collagen, the main component of articular cartilage. UC-II is not absorbed in the body, but binds to the surface of the lower intestine where it triggers an immune response that stops the body from attacking and breaking down healthy cartilage. Sodium Hyaluronate – 20 mg.
$39.99 for a 30 day supply (30 capsules). MDrive offers a 60 day money back guarantee that includes a refund of the full purchase price less shipping costs. The product source also provides a number to call for additional product information as well as an customer service internet link. Finally the product source includes a number of customer reviews and also contains a tool to locate local dealers (the product is sold through a dealer network). This product is expensive ($39.99 for a thirty day supply) although the product source provides ample information about the product and its benefits. Since the product is sold through a dealer network, potential purchasers may want to contact a local dealer for more information about the product and its benefits if needed before making a purchase. Mark Stevens	reviewed Mdrive	on February 2nd	 and gave it a rating of 2.